In summer, people get tanning on hand and face. 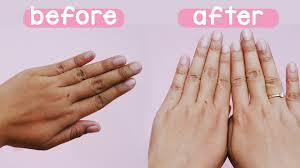 There are several home remedies that remove tanning easily from the hand. Yogurt & Turmeric: Prepare mixture of half cup yogurt with one pinch of turmeric. Apply it on hand properly. Leave it for 15 minutes. Then wash it with cold water. Do this remedy before bath every day. This removes tanning in 2 weeks. Yogurt has probiotics that gives glow to the skin. This makes skin bright. Aloe Vera: Extract pulp from the aloe vera leaves. Apply it on hand and take a sleep. Wash it with cold water in morning. Do this remedy for 2 weeks. Aloe vera protects the skin from the radiation damage. It is known for tanning and skin light. Lemon: Extract the lemon juice and mix it in hot water. Keep your hands for 15 minutes. Then, wash your hand with cold water. Do this remedy for 2 weeks. Lemon contains vitamin C that avoids tanning of the skin. It also protects the skin from UV rays. Almond: Soak 5 almonds in water for overnight. In morning, blend these almonds with milk. Apply this paste on hand before bed at night. Wash your hand with cold water in morning. Do this remedy for 2 weeks. Almond contains riboflavin, vitamin and minerals. It nourishes the skin and avoids tanning.